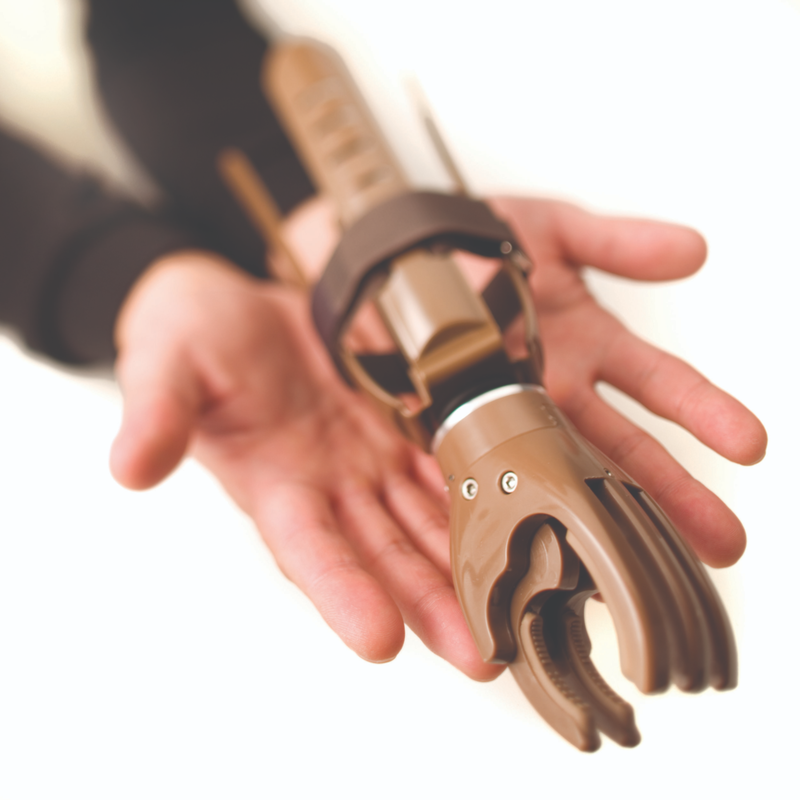 The LN-4 prosthetic hand is a low-cost, light, durable, functional prosthetic hand. Ernie Meadows, Michael Mendonca, and Maurice LeBlanc, an award-winning mechanical engineer who spent his career focusing on assistive technology for people with disabilities with special interest in upper-limb prosthetics, all worked to develop a hand that could be cheaply produced but maintained a high level of quality. After several years of testing, the resulting hand was named the LN-4 prosthetic hand after Ernie’s deceased daughter Ellen. In order for this device to be successful, recipients must have 14cm of residual limb below the elbow to utilize this prosthetic device, measured from the tip of the elbow to the tip of the remaining arm to assure a strong fitting for the cuff. Additionally, there can be no remaining fingers, thumb, or wrist, as these will interfere with the cuff and are likely more useful than the LN-4 hand. Finally, the arm should be flexible and fully healed with no open sores or bandages to interfere with the attachment. While innovative and resourceful partners have developed several “work-arounds” that allow for people who do not meet these criteria to use the LN-4 hand, they are usually unique to the clinic distributing the hand. However, we are working on compiling a list of best practices to use in the near future. Recently, Ernie Meadows and Maurice LeBlanc (mentioned above) have developed an LN-4 above elbow device. This above elbow invention allows us to provide a prosthetic device to a greater range and number of upper-limb amputees, and we look forward to rolling this out with our partners in 2019. Below, we provide a number of training videos for your perusal. If you have an LN-4 hand and require additional information, please contact us and we’ll be happy to assist you. Michael Mendonca, our Founder, demonstrates how to fit an LN-4 hand. Instructional video for grips and use of the LN-4 Prosthetic Hand. An LN-4 Ambassador provides you with a step-by-step process as to how to fit the hand and then demonstrates different methods to utilize the hand. Jim Yoder, our Board Vice President, shows how the LN-4 hand can grip items. 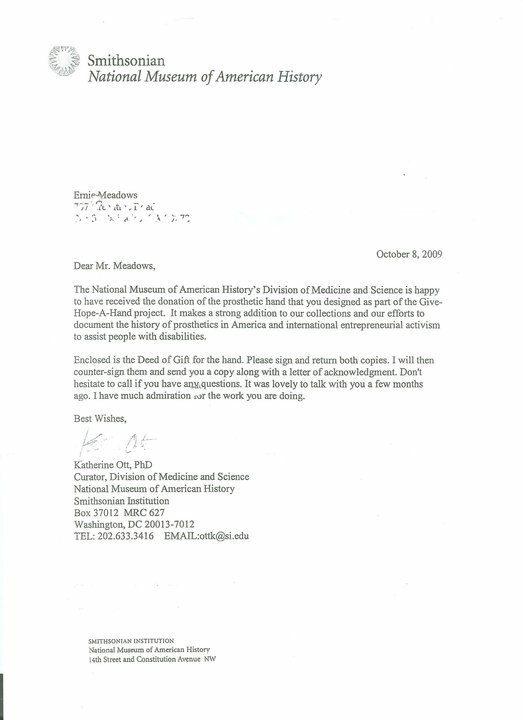 On October 8th, 2009, the LN-4 prosthetic hand was added to the Smithsonian Museum’s collection for modern technical innovations in prosthetics.